You should have arrived from Dawn's blog. 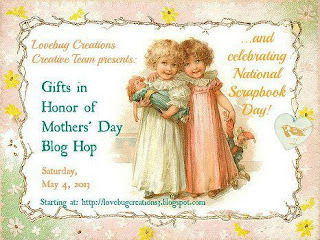 If you happened to have stumbled upon my blog please start from the beginning at Lovebug Creations!! 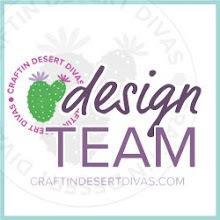 You won't want to miss a stop as there is a $15 gift card to the Lovebug Creations store, but you must comment and follow each stop on this hop. 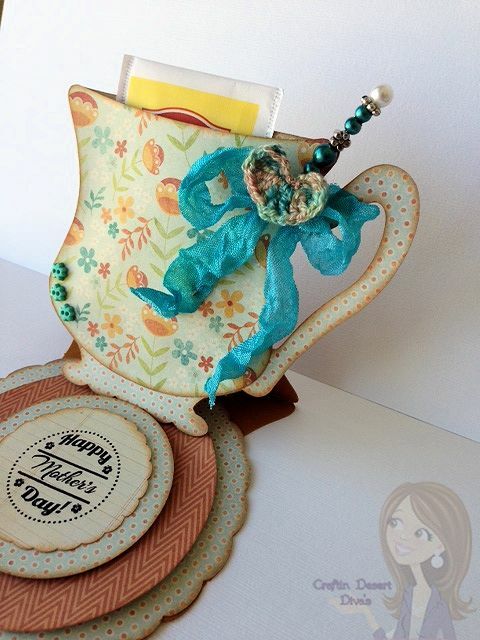 This Teacup Easel Card with pocket is from My Scrap Chick. The papers are from MME Reunion pad. To make this special for my mom I added Caddy Blue Rumple Ribbon up in the corner and layered it with a Pinque Peacock pin and a crochet heart. 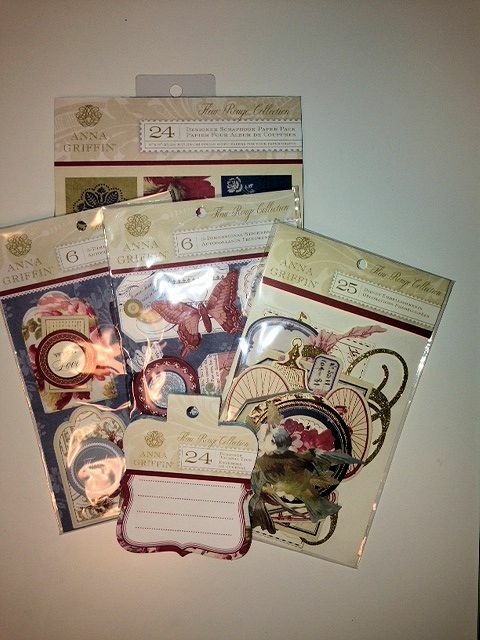 I did ink up all the edges with Tim Holtz Tea Dye Distress Ink. The Dancing in Circles 2 from Scrappy Mom's Stamps was perfect for the center scalloped circle. Here's a side view of the teacup card. Your next stop is the talented Martha! Adorable, It´s perfect for a mother!! Love the fold!! Your tea cups are adorable, I love them! 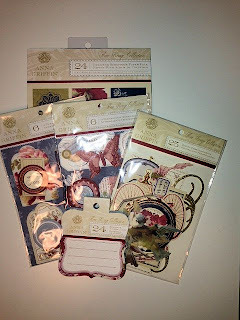 I wish I was able to win your blog candy, what a beautiful collection! Good luck to the other ladies! Oh this is too sweet and pretty! I bet she will love it!!! I adore the shape and "Caddy Blue" was a great choice for this! Thank you soooo much for being in this hop with us! I hope you'll join us again!!! So pretty - I'm looking forward to seeing the rest of them. I am really loving these tea cup easel cards I've seen lately and yours is absolutely gorgeous. I love the addition of the blue ribbon and the crochet heart. what a beautiful card Tara!!! What a beautiful card! Love all your cards! 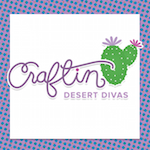 Love your pretty paper and the beautiful pin! So pretty--I like the ribbon, crocheted heart and pin together. Beautiful tea cup card! Love easel cards, but never seen one as unique as this one! 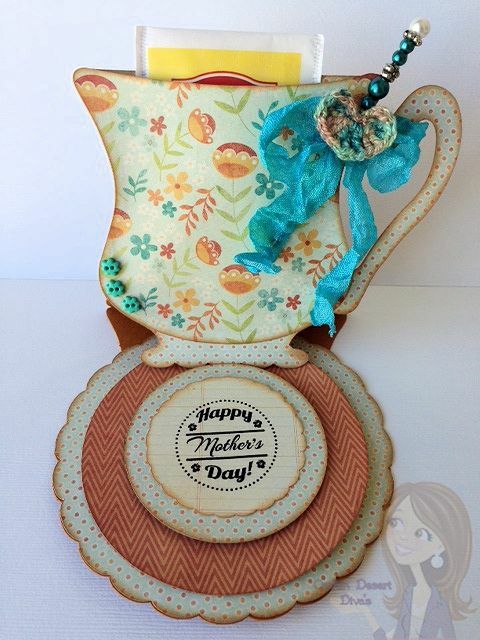 I love easel cards - this is so adorable - I have never thought of a teacup! That easel card is just adorable!!!! cute idea for a tea bag! What a great idea!! I just started following you blog!! I'm so glad you joined us today! love your card!!! So pretty!!! Pretty card, love that easel, I came by looking for Jo's Blogaversary hop but didn't see it. I love your easel card! Your project is beautiful. Love your colors and decorations. I liked your FB page! And Wow! Sure glad I did,your inspiration is over the top! Thanks ♥ "Happy Spring"
Oh goodness your project is beautiful Tara! I just adore this... so pretty and elegant! I have never seen an easel card like this before! This is stunning and inspirational! Jo was right when she said you will be impressed with what the other ladies create! XOXO, Julie. :0) I'm a new follower too!